Welcome to the PREMIER Flathead Lake Charter Fishing Service! Bagley Guide Service is a first class Flathead Lake charter fishing service in beautiful Bigfork, Montana. Flathead Lake is 27 miles long, 15 miles wide and has over 160 miles of shoreline. It is the largest natural freshwater lake west of the Mississippi River, known for its crystal clear water, beautiful mountain scenery and world-class Trophy Lake Trout. We are professional, friendly, and enjoy what we do. We have a proven catch record and the experience necessary to help make your trip a success. Whether you are a beginner who has never been fishing (we love helping children catch their first fish) or a seasoned angler looking for a trophy fish of a lifetime, we specialize in CATCHING FISH and make sure you have a GREAT TIME while doing it!!! We fish for the largest Trophy Lake Trout. Trophy fish up to 20lbs are common with fish over 30lbs caught each year. These trophy fish can be anywhere from 36″ to 45″ in length. We work hard and have the ability to put our guests onto fish. Flathead Lake is a large body of water and the fish move around as conditions change; such as baitfish movement, weather conditions and the time of year. We have the knowledge and experience to know when and where the fish are located at different times throughout the year. In addition to having the BEST charter boat on Flathead Lake, we feel our experience is what seperates us from our competition. 2019 is our 24th year in business under the same ownership. In additon to Flathead Lake Fishing Charters, we also offer Flathead Lake and Wildhorse Island Scenic Tours. Our tours can include Painted Rocks (rock cliffs with pictograghs which some of are believed to be close to 3000 years old), Wildhorse Island ( A 2160 acre island that is home to wild horses, Bighorn Sheep, Mule Deer, Bald Eagles, and Osprey), and many of the gorgeous homes and sights on Flathead Lake. We can customize our tours to fit your needs. 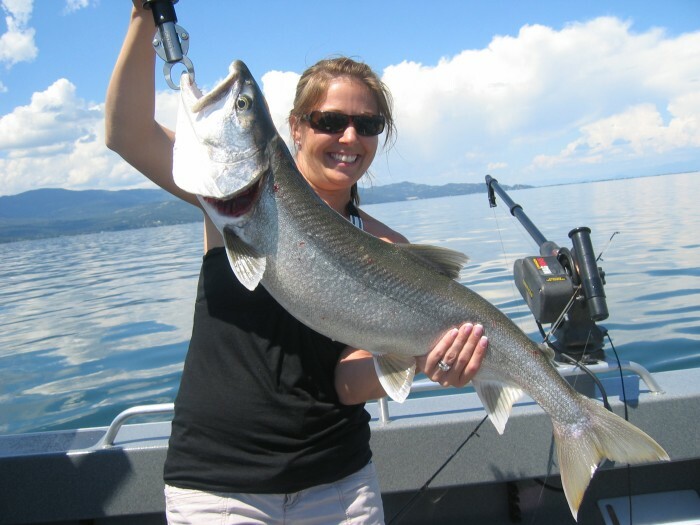 We invite you to join us on a fun filled, action packed half-day or full-day fishing charter or tour on beautiful Flathead Lake.